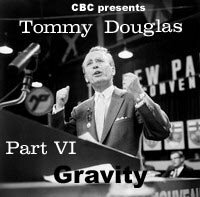 TORONTO - The CBC has pulled the first thirty-four episodes of “Tommy Douglas; Creator of Worlds”, due to harsh criticism by the historical community. Historians in that community say the episodes where Mr. Douglas discovers the Panama Canal, ends World War II, invents the light bulb, founds the United Nations, conducts the first heart transplant, brings no-touch icing to the third world, and pilots a Swift Boat up the St Lawrence River allowing Wolfe’s men to scale the cliffs below Quebec City and defeat the French forces; while beautifully photographed are historically inaccurate. A spokesperson for the CBC apologized for the inaccuracies and said the episodes would be re-edited to leave out the part about the light bulb.